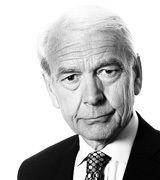 John Humphrys - Should ex-Prime Ministers Engage or Shut Up? March 01, 2018, 2:05 p.m.
As if Theresa May didn’t have enough problems on her plate, two of her predecessors have weighed in to warn that she may be leading the country to disaster. Both Sir John Major and Tony Blair, at the same time as insisting that they are trying to be helpful, have not only criticised the government’s Brexit strategy but have argued that the public should be given the chance to change its mind entirely and keep Britain in the European Union. Meanwhile, two other former prime ministers, Gordon Brown and David Cameron, have largely stayed schtum even though they were both ardent Remainers. What’s the right way for ex-prime ministers to behave? Should they get stuck in or bite their tongues? In a speech to the Creative Industries Federation on Wednesday, Sir John Major, Tory prime minister in the 1990s, charged Mrs May with letting her demands on the terms of Brexit be ‘so tilted to ultra-Brexit opinion’ that it would be ‘impossible to reach a favourable trade outcome’. He said the government’s position was ‘unrealistic’ and that he knew of no precedent for a government enacting a policy ‘that will make both our country and our people poorer. … The emerging evidence suggests Brexit will hurt most those who have least’. He advocated giving Parliament a free vote on the final deal and leaving open the option of a second referendum so that the public would have a chance to reverse its decision to leave the EU. The man who unseated Sir John, Tony Blair, has also been calling for a second referendum once the terms of the final Brexit deal (if there ever is one) are known. He not only believes it is in the country’s economic interests to do so, he also thinks the future of peace in Northern Ireland, brought about through a process started by Sir John and completed by him in the Good Friday agreement of 1998, is at stake. He said on Thursday that he found it ‘sickening that people should really be prepared to sacrifice peace in Northern Ireland on the altar of Brexit’. There seems no reason to doubt the sincerity with which Sir John and Mr Blair hold their views. The issue is whether their status as former prime ministers bestows a particular duty on them to speak out when they believe such vital matters are at stake, or whether they should refrain from engaging in political debate having had their time and knowing how difficult it is to do the job of prime minister. Former prime ministers in the past have taken different views on this question. When James Callaghan left office in 1979 he said, using an analogy from his navy background, that he wasn’t going to leave the captain’s cabin only to end up spitting on the deck. And he largely stuck to his own advice, only occasionally making magisterial interventions on the floor of the House of Lords. Edward Heath, also a former sailor, set a very different course. After losing No 10 in 1974 and then the leadership of the Conservative Party a year later, he didn’t exactly spit on the deck but he did scowl on the backbenches for the next twenty years, making life difficult for his successor, Margaret Thatcher. A smile returned to his face only when she was turfed out in 1990. She might have been expected to learn the lesson of this experience when treating John Major, her own choice to succeed her. But, on the contrary, she became even more outspoken in her criticism, both public and private, of the way he was running the country, and encouraged the Eurosceptic ‘bastards’ in their party to make it almost impossible for him to govern. The result was the massive Tory defeat in 1997. These examples from history would suggest that what former prime ministers ought to do (and certainly what prime ministers in office want them to do) is retire gracefully and tend their bank balances. But it is not as simple as that. Anyone who has had the ultimate responsibility of steering the country’s destiny for a few years is almost bound to think it their duty to speak out if they think it is now being led to hell in a handcart. And others will insist that it is their duty. In his recent book on how Churchill became prime minister in May 1940, Nicholas Shakespeare recounts how David Lloyd George, the prime minister who had led Britain to victory in the First World War and who was still an MP, was determined not to speak in the debate on the fiasco of the Norway expedition and had to be shamed into doing so by his colleagues. His reluctant speech, a masterpiece of oratory, was regarded as the single greatest contribution to the defeat of the prime minister, Neville Chamberlain, the appointment of Churchill and then, some would say, to Britain’s ultimate victory in 1945. To some, a precedent such as this illustrates why former prime ministers should not be reticent in continuing to engage in political debate and why both Sir John and Mr Blair are justified in their recent interventions. But sceptics would question this on at least two grounds. In the first place, they’d say, neither of these two ex-prime ministers is any more a member of parliament, each of them having chosen neither to remain in the Commons nor to be elevated to the Lords, as would be their right. They have deliberately excluded themselves from the main democratic forum of our democratic politics and have therefore, it’s argued, surrendered a large part of their legitimacy as participants. But there is a second reason these two are criticised. Both are advocating policies that might have the effect of overturning a decision taken by the people in a referendum. This, their critics claim, would not only be undemocratic but would be dangerous because it could well fuel the sense that an elite is trying to deny people their democratic right and risks giving ammunition to those who believe that parliamentary democracy exists merely to thwart the people’s will. Sir John is accused too of hypocrisy by advocating a free vote in parliament on the Brexit terms even though he refused just that when he was bludgeoning the Maastricht Treaty through parliament. Their defenders, however, would say that Brexiteers have always argued that parliament is sovereign, so why shouldn’t there be a free vote in it on the Brexit terms, and why shouldn’t parliament legislate for a second referendum if it wants to? Meanwhile, David Cameron sits quietly writing his memoirs and Gordon Brown appears to believe that his time is past and that he should intervene only very rarely, as he did over the Scottish referendum. So how should former prime ministers behave? Should they retire into obscurity or should they be ready to say what they think when vital choices face the nation? And what do make of the attempt of both Sir John Major and Tony Blair to create circumstances in which Britain might change its mind over Brexit?